You need to invest in a quality pair of MIG Welding Gloves to protect your hands when welding. To be honest, you better buy a few pairs because not only will you wear them out, but if you’re like me you will lose a few gloves along the way. At any rate you need to protect your hands from the hazards of welding. 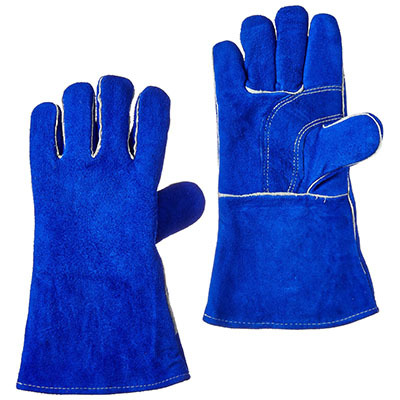 The welding process generates a ton of heat, so you will need thick leather gloves to handle the parts after welding. Not to mention protecting your skin from the harmful UV rays that are emitted while welding. Choosing the right type of MIG Welding Gloves for your specific application may be more complicated than you think. If you weld a lot of small intricate pcs, you will want a glove with excellent dexterity characteristics. For heavy fabrication, you will want thicker gloves to insulate your hands from the intense heat. In both cases, you want a long glove to protect your arms from molten balls of metal, which will burn a nice little hole in unprotected skin. The US Forge 400 MIG Welding Gloves are pretty basic but they are perfect for general purpose welding. The thick, lined leather will protect your hands from the heat. The extended length will protect your forearm from molten metal. Even though the gloves are heavy duty, the leather is still quite pliable providing so you handle small parts reasonably well.